These multi-band arena bills are great for promoters, not so great for punters. It was three years ago that a similar tour (only with three bands that time) also headlined by Alter Bridge proved to be a bit of a watershed moment for me, in all my gig-going years. That show, midweek at Manchester’s huge arena, started bang on 7pm and in order to get there from where I was working at the time (Mold, in North Wales) meant an early dart. One stressful stop/start run along the M56 (after a long day’s work, not to mention a hefty commute that morning just to get there) and I barely made it in time for the first band. By the end of the night I was out on my feet, and with a run back home to look forward to plus having to be up again early the next morning, I decided something really did have to give. Since then, I’ve tried to keep gigs to weekends unless they’re in the Liverpool area (which isn’t something that happens that often, a frequent complaint of mine and a subject for a post on another day) and so when this tour was announced earlier in the year, I plumped for Nottingham simply because it fell on the Saturday, rather than Manchester which once again fell midweek. That in turn led to another frustration of mine (the gig clash), as on this same night Aussie nutters Airbourne were in Manchester with Crobot supporting. That’s a gig I’d have liked to see too, and if only one of these tours had found their way to Liverpool I might have been able to do that too, but it was not to be. So it was that I headed back down the motorway to the Midlands, the East this time and Nottingham’s newly-renamed Motorpoint Arena. For a large-scale arena it is surprisingly intimate, in fact I think Liverpool’s Echo Arena is a little bigger. The floor does not seem to stretch back as far, and I reckon a seat in the back blocks of this place would still give you a decent view (unlike some arenas where you’re halfway home again if in the back section). Thanks to Google having one of its periodic wobblers however, I found myself being led on a magical mystery tour of Nottingham as the app in my phone assured me that my destination (a shopping centre car park a short walk from the venue) was ‘just around the corner’, as I found myself rattling down an unadopted road with little in the way of city centre facilities. It did this at least twice before I eventually pulled over, and completely cleared the phone app and started over. Note to self: invest in a proper sat-nav! Eventually I found the car park, and the venue was indeed only about five minutes away on foot. On entering, opening act Like A Storm were already on the stage. I’d hoped to get here early enough to catch all the bands and get a good spot reasonably close to the front, and although I missed the start I saw enough of the Kiwi ‘didgeridoo metal’ act to get a good impression of them. They were good live, but apart from the occasional use of said didgeridoo from frontman Chris Brooks, weren’t anything I hadn’t seen or heard before. Towards the end of their set they delivered a cover of AC/DC’s ‘TNT’ (downtuned to fit their overall sound) which did get the early attendees rocking. Next band up were French metallers Gojira; there was a sizeable element to the crowd who were here for this band. Another good live band who weren’t really my cup of metal, the most impressive performance for me was courtesy of drummer Mario Duplantier. Their material appeared built upwards from his relentless pounding, and although they played well and got their fans going, it all was a bit too reminiscent of 90s shouty nu-metal for me. Special guests Volbeat also had a considerable portion of the crowd here for their set, indeed one sign in the stand actually declared ‘Only Here For Volbeat’. 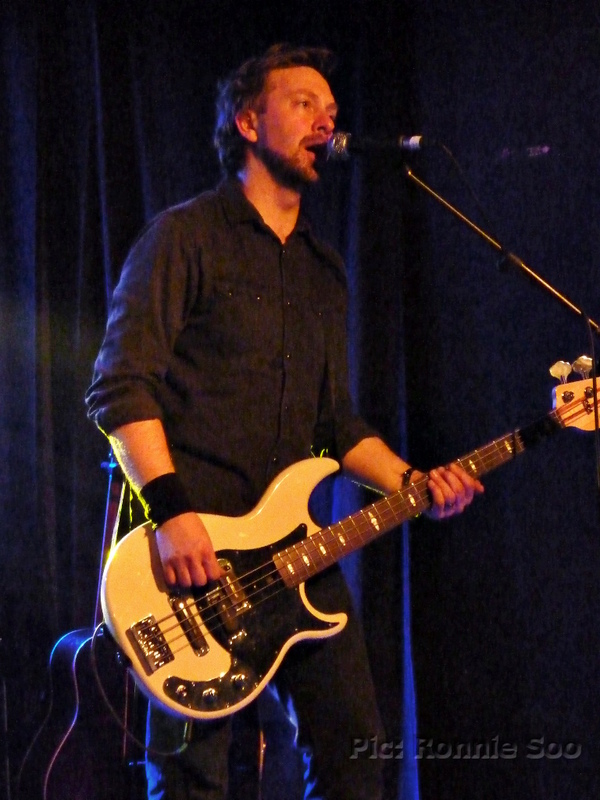 The Danish four-piece, fronted by vocalist/guitarist Michael Poulsen, were impressive. Poulsen had a strong voice, and their set had some good singalong material including ‘The Devil’s Bleeding Crown’ and ‘Sad Man’s Tongue’ (preceded by a snippet of Johnny Cash’s ‘Ring Of Fire’ – now that WOULD have gone down well had you played in Liverpool, guys!) For ‘Evelyn’ they brought out Napalm Death frontman Barney Greenway who elicited cheers, though his grunt vocal contrasted starkly with Poulsen’s more traditional rock ‘n’ roll voice. I enjoyed their set, despite the antics of one prat in the crowd who pushed in and caused mayhem until ejected by the stewards, and despite Poulsen getting nobody up on stage when he invited it for closing number ‘Still Counting’. Perhaps the stewards weren’t having any of that here! I always look forward to seeing Alter Bridge live, however it’s been clear that despite two (now three) new albums, their live sets always leaned heavily on second album ‘Blackbird’, giving the impression that the ‘Blackbird’ tour simply continued on and on past 2008. This was the tour where they finally started to move away from that album, with a more balanced set which gave all their albums a shake. They still played five tracks from ‘Blackbird’, with four off current offering ‘The Last Hero’ and predecessor ‘Fortress’, but it was an improvement especially considering when I saw them last in 2013, then-current album ‘Fortress’ had only three tracks performed that night! This was one of frontman Myles Kennedy’s better nights; I make this my eighth Alter Bridge show and I’ve seen him in terrific form and I’ve seen him when he is suffering badly. This was the former, the British weather hadn’t struck as badly this time and his throat benefited from that. However what let this down a little for me was the sound; once again it was a mix heavily dominated by bass. Four-stringer (five, in fact) Brian Marshall spends much of the show at the back stood by Scott Philips’s drum riser, but there was no avoiding his sound as it dominated, if not quite swamped, Kennedy and guitarist Mark Tremonti. 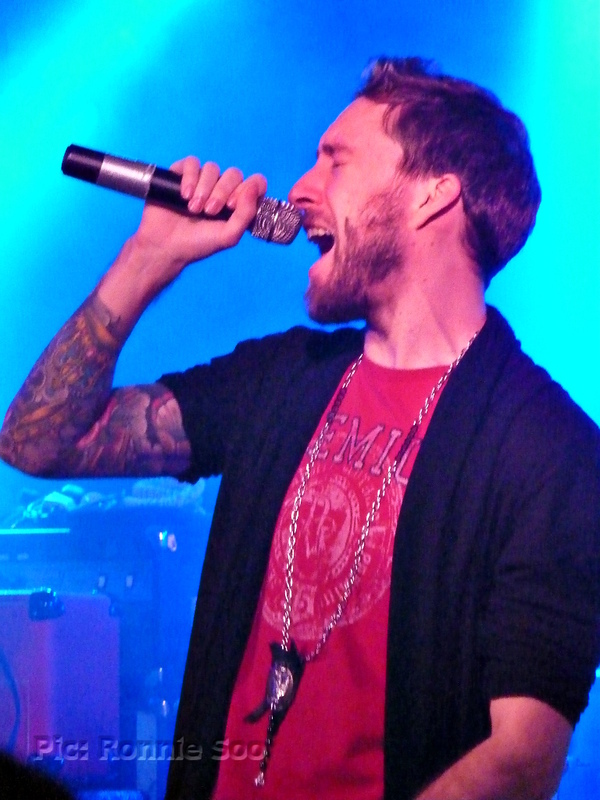 As in 2013, Kennedy had two microphones (one at stage right) and alternated between the two. A surprise came after the band performed ‘Isolation’; Tremonti took to his mike to point out a young fan who had been totally lost in the performance to that point, and then took the guitar off his back and HANDED it to that fan! I later found out this gesture was in conjunction with his guitar supplier PRS Guitars, he has been playing a production model for one number and handing it out at selected gigs. It still looked mightily impressive and as Tremonti explained, it was motivated by a desire to keep this style of music alive for the next generation. There was some knockabout banter between Kennedy and Tremonti before the band performed the epic ‘Blackbird’, and this time the preceding excerpt from the Beatles song of the same name had been restored. (That’s another one that would go down great should you perform in Liverpool, AB!) Kennedy was playing noticeably more lead guitar this time around, especially in the newer numbers and the defined roles of singer/rhythm guitarist (Kennedy) and lead guitar (Tremonti) were a little more blurred as a result. That was even more pronounced when they performed ‘Waters Rising’ from the previous album, with Tremonti taking lead vocal. I wanted to enjoy this show more than I actually did however, since that bass overwhelmed the proceedings. I would have scored this at three inflatable guitars but two things prompt me to award one more: firstly they are making an effort at last to move on from their second album and secondly, Kennedy’s vocal performance was probably the best I’ve seen from him since about 2008. It may be down to the fact that he has actually had something resembling a break this time, with Slash putting his Conspirators on ice to hook up with W. Axl Rose and Duff McKagan in the part-reunited Guns n’ Roses, while Tremonti has ploughed on with his solo tours when not performing with Alter Bridge. With a better sound mix I’d have praised this as their best show I’ve seen by them to date, as it was I’m just encouraged. For me then, Volbeat were band of the night as they had by far the best out-front sound as well as some good songs. Such a mouthwatering double bill for classic rock fans, yet there were no dates scheduled for the North West of England. Having looked at the schedule for the Saturday date then, it meant a trip down to the Second City. This is a true co-headline tour, with the Daisies and The Answer rotating the closing slot, and on this night it was The Dead Daisies who would be last band up. The gig took place in the 600-capacity Academy 2 and was a sell-out show, as were several on the tour. Opening act was Lynne Jackaman, one-time lead singer for the band Saint Jude who has now gone solo, styling herself as JACKAMAN. For this tour she performed with just acoustic guitar for company (provided by Danny Page). She’s been on my ‘keep meaning to see’ list for a long time, but this was actually the first time I’d seen her live in any guise. The start of her set was fluffed, as she walked on as her musical partner played, then walked off again immediately with a ‘Thank you – goodnight!’, laughing as she went. It turned out that the guitarist had forgotten his ‘capo’ for the guitar, meaning the opening chords were all out of whack. ‘What a w**ker!’, said the singer as she reappeared (jokingly, it should be emphasised!) to start properly once the capo was located. She’s only a slight figure but has a mighty voice, her short set drew warm applause from those that came early. There was barely a pause between the end of the JACKAMAN set and the entrance of The Answer, as their kit was already set up there wasn’t much to turn around. They released a new album ‘Solas’ last month which has split their fan base, with its more rootsy musical direction delighting some fans while shocking others, who expected more of the same no-nonsense hard rock they had provided on their five previous albums. The band obviously believe in this new album, since no fewer than nine of its eleven tracks were performed in this set, opening with the epic, Zeppelin-esque title track. All seemed well at the start as James Heatley pounded the opening drum beat, joined by bassist Micky Waters then guitarist Paul Mahon, but as trilby-wearing singer Cormac Neeson made his entrance he couldn’t initially be heard. Only when he raised his voice for the second verse did he begin to cut through, and later on a shout from the crowd to ‘turn your mike up’ was acknowledged by Neeson with humour (‘lead singer’s privilege, always be louder than the others!’). The set may have been weighted heavily towards the new album but it was still The Answer we know and love, when the ‘Solas’ material was performed live there wasn’t the same restraint shown on record, so it rocked as hard as the selected older songs they played such as ‘New Horizon’. The mandolin did come out for ‘In This Land’, and a bouzoki was used by Neeson (‘not a bazooka, although it’s just as dangerous in the wrong hands!’, joked the singer), but anyone who thought they’d gone soft with this record would have to think again after seeing this set. 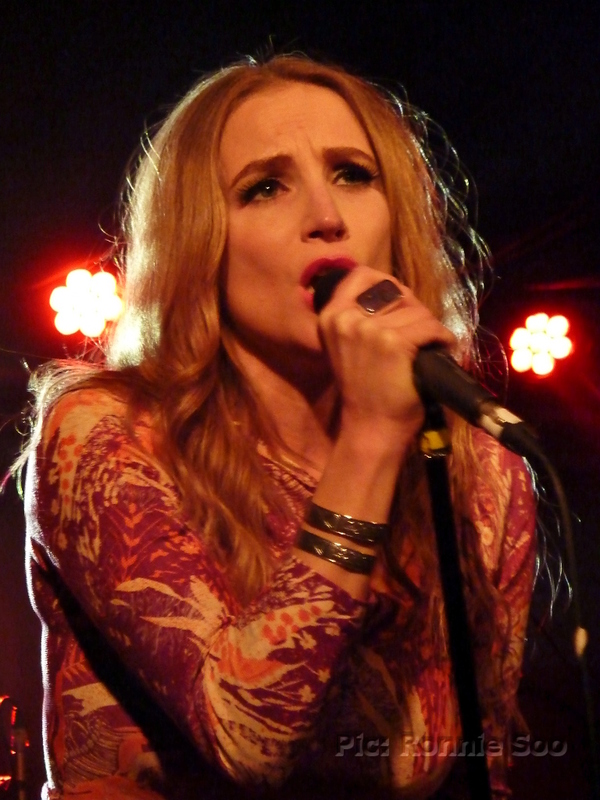 A treat came midway through when the band performed ‘Nowhere Freeway’ (from 2011’s ‘Revival’ album) accompanied by Lynne Jackaman, who appears on the recorded version. With only 75 minutes and with a set leaning so much on ‘Solas’ there wasn’t much space for older songs, notably nothing was performed from debut album ‘Rise’. (The band did mark that album’s tenth anniversary with a lavish reissue packed with extras, and by playing a short run of dates performing ‘Rise’ in full earlier in the year, however.) They signed off with ‘Battle Cry’ (which reminds me a little of ‘Be What You Want’ off ‘Rise’, especially live), complete with its Gaelic refrain. They must have been happy that they got such a good reception from this crowd having debuted so many new songs, but they performed with their usual 100 per cent intensity, with the singer doing his now-familiar jump-into-the-crowd routine near the end of proceedings. When they come around again next year, be sure to go along. I last saw The Dead Daisies three years ago in Liverpool, when they supported Black Star Riders (whose bassist that night was Marco Mendoza, now a Daisy himself) but, this present lineup is such a different animal that it is impossible to consider it the same band. (Cue shouts of ‘Whitesnake’ or ‘Rainbow’ – but those acts were defined by their founder members.) Only rhythm guitarist (and financial backer) David Lowy remains from the band I saw back then, and the group now surrounding him is made up of some of the finest hard rock musicians LA has to offer. 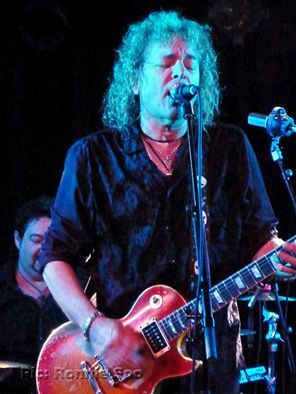 Musicians have come and gone throughout the Daisies’ relatively brief history, as the players Lowy has recruited have all been of such high calibre that they were inevitably involved with other projects. He seems to have found some stability at last now, with vocalist John Corabi and drummer Brian Tichy having been around for the last two years. Guitarist Richard Fortus departed the band early in 2016 order to join up with W. Axl Rose, Slash and Duff McKagan in the partially-reformed Guns ‘n’ Roses, as did keyboardist Dizzy Reed. 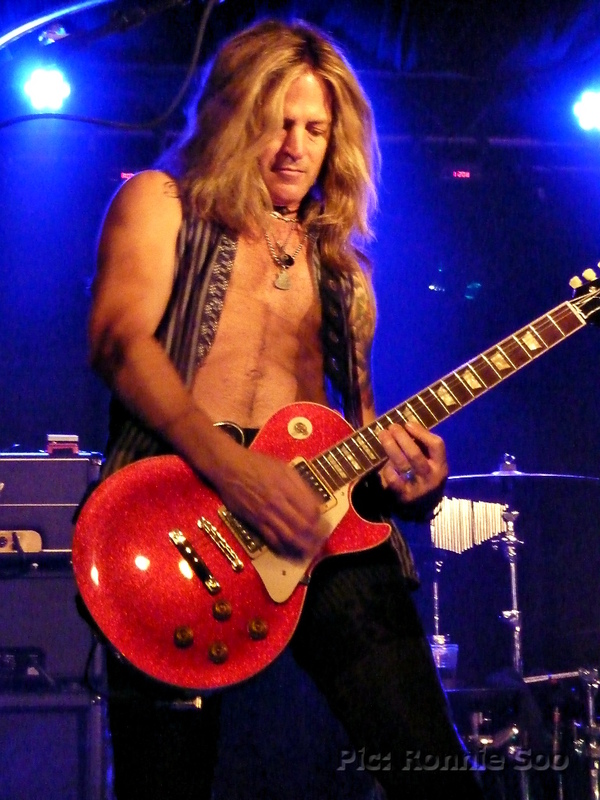 This opened the lead guitar slot for ex-Whitesnake man Doug Aldrich, who joined up in time to contribute to current album ‘Make Some Noise’. With his addition, three ex-members of latter-day Whitesnake are now Dead Daisies, attracting attention from fans of Coverdale’s outfit. 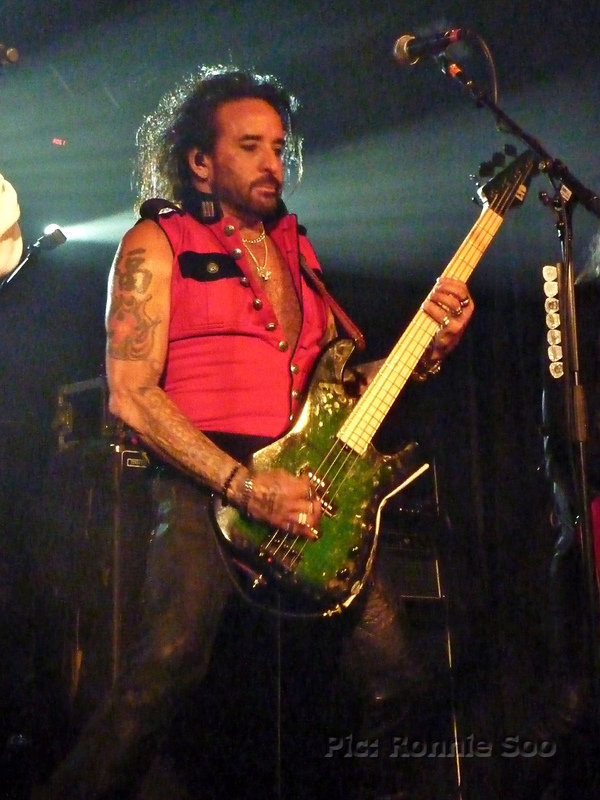 The Dead Daisies of today are a much harder rocking proposition than before; the band I saw in 2013 were musically excellent but didn’t quite do ‘it’ for me. This lineup certainly does however, with several of the players familiar to me from their previous bands I knew just what they’d bring, hard riffs and hard pounding drums, and they did not disappoint. The Daisies’ set also leant heavily on their most recent release, with eight tracks from ‘Make Some Noise’ performed (including both covers, CCR’s ‘Fortunate Son’ and The Who’s ‘Join Together’). The only nod to the earlier Jon Stevens-fronted incarnation came with ‘Lock n Load’ from the debut album, performed mid-set, yet even this is now a heavier proposition delivered by a quintet now operating without Reed’s keyboard texture. 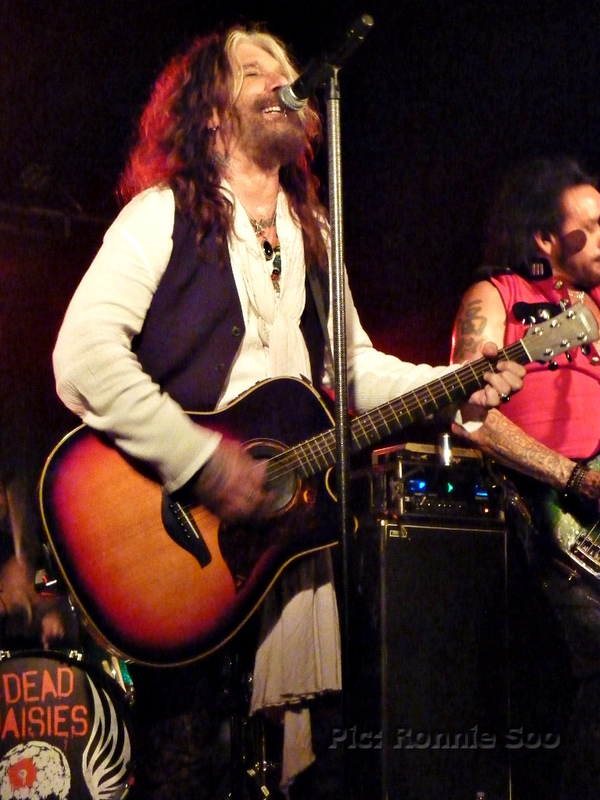 Corabi proved an engaging and charismatic frontman, often joking about with bandmates such as Marco Mendoza. He is also a fine singer, and the vibe I got from this performance was reminiscent of that I got when I saw CATS in SPACE a few weeks ago. These guys are of a similar age to the CATS, and like that band they know each other well. That showed in their playing, it came across like five old friends having a ball on stage. It must be very satisfying for David Lowy having put this act together, although he is the glue holding it all together he prefers to stay in the background allowing the big names he recruited to strut their stuff. The Dead Daisies are still described as a ‘musical collective’, but it is to be hoped that this incarnation can stay together long enough for at least another album and tour. If they can then it’s likely that it will be bigger venues next time around, so this was a pleasure to see such high-quality musicians on a small stage. A rare award of five inflatable guitars for this gig it is, then. Another year, another Delain touring cycle. 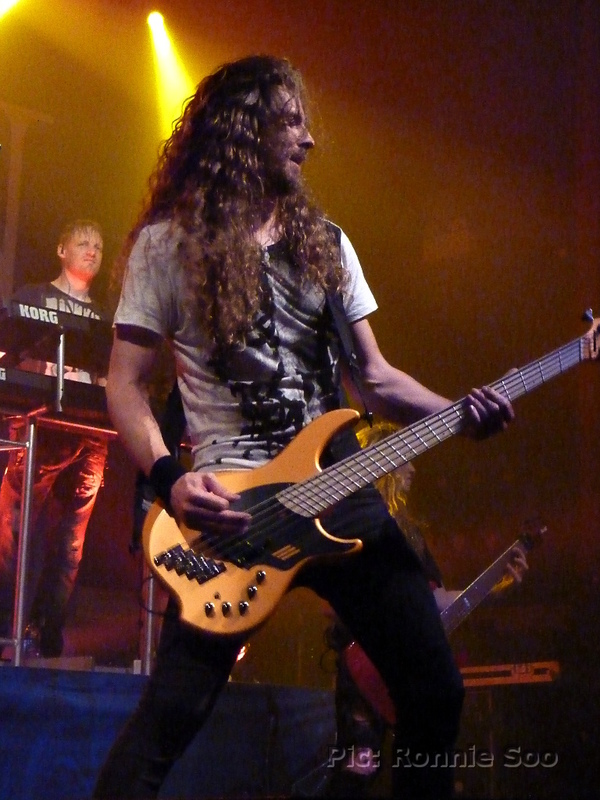 The Dutch symphonic metallers have put a lot of miles over the past few years, with prestigious support slots with Nightwish in the US as well as headline shows in the UK and Europe. This time around the tour is in support of their recently-released sixth album ‘Moonbathers’ and for their Manchester date they were booked into the 1500-capacity o2 Ritz, a step up from their previous appearances at Club Academy. With a club night scheduled to follow this gig, it was quite an early start for the show (a three-band bill); following a meet and greet/acoustic performance by Delain for the small group of fans who took up the VIP package (and got first pick of spot on the all-important barrier) the doors opened and plenty were already in place for openers Kobra and The Lotus. A Canadian quintet fronted by the stunning Kobra Paige, their music is traditional Metal with plenty of fist-pumping and shredding solos courtesy of guitarist Jasio Kulakowski. 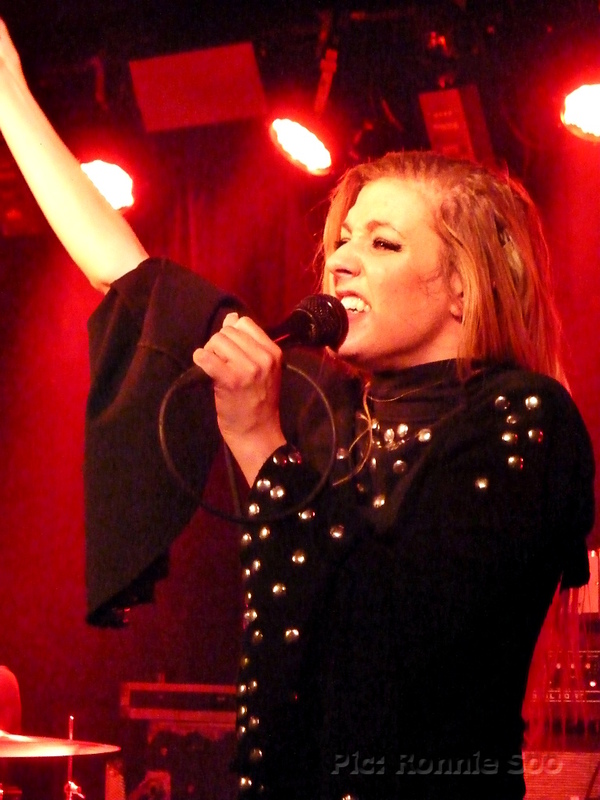 Paige, a classically trained singer who turned to Metal while still in her teens, demonstrated a strong voice and was pleased at the warm reception from the Manchester crowd. 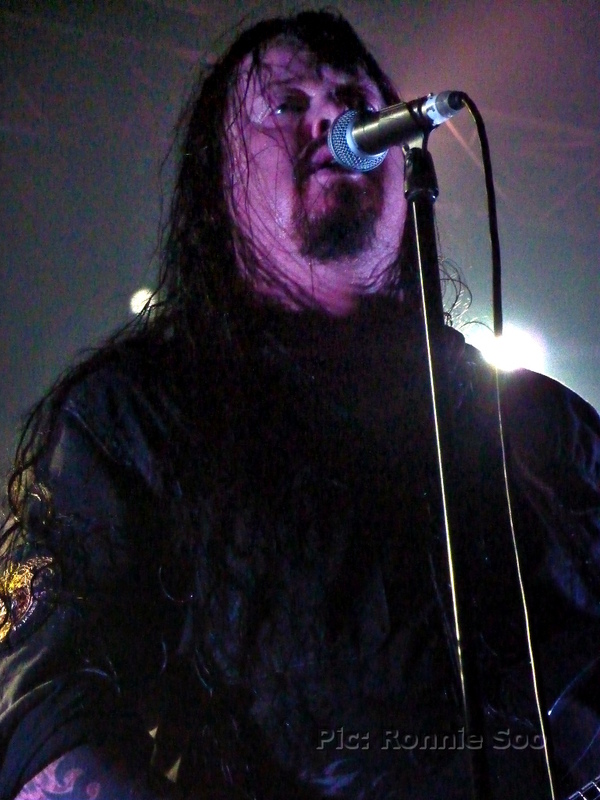 Evergrey were up next, a Swedish outfit based around vocalist/guitarist Tom S. Englund. Their style of Metal is also old-school with plenty of harmony guitars from Englund and fellow axeman Henrik Danhage, and has more than a little Maiden influence. The quintet had a better sound mix (a little less bass-heavy) for me than the openers and went down well with the crowd, some of whom were clearly there for Evergrey as the band’s name was chanted from pockets of the crowd on the floor. The frontman got a cheer when he mentioned that they’d play ‘In Orbit’ which on record features Nightwish singer Floor Jansen, only for him to dampen it down by adding that he’d have to perform her part as she wasn’t there (!) He then got a boo when he announced to this crowd that he was a Man Utd fan (cue some loud boos emanating from my spot, ahem! ); presumably he thought that’d go over better than it actually did! (Not everybody there was from Manchester, Tom – those who were could well have been City fans 😉 ) Football banter aside, they gave a very good set and are worth seeing if they play in your area. 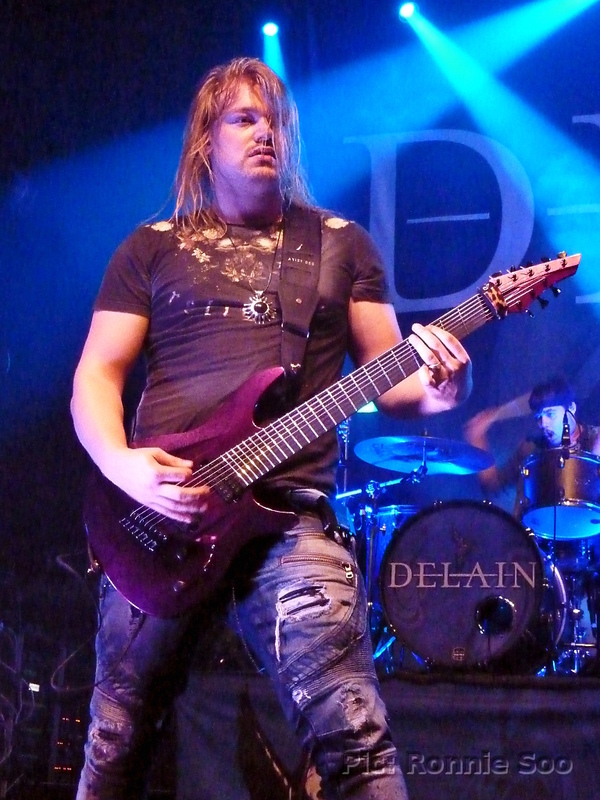 Delain came on at 8:30 sharp with drummer Ruben Israel appearing first to the intro music (‘Monarch’ from the recent ‘Moonbathers’ album), who then started to play along to the intro, joined by guitarist Timo Somers and then the rest of the band. They opened with album lead-off ‘Hands Of Gold’ and were straight into that synchronised headbang routine that has become a familiar sight. 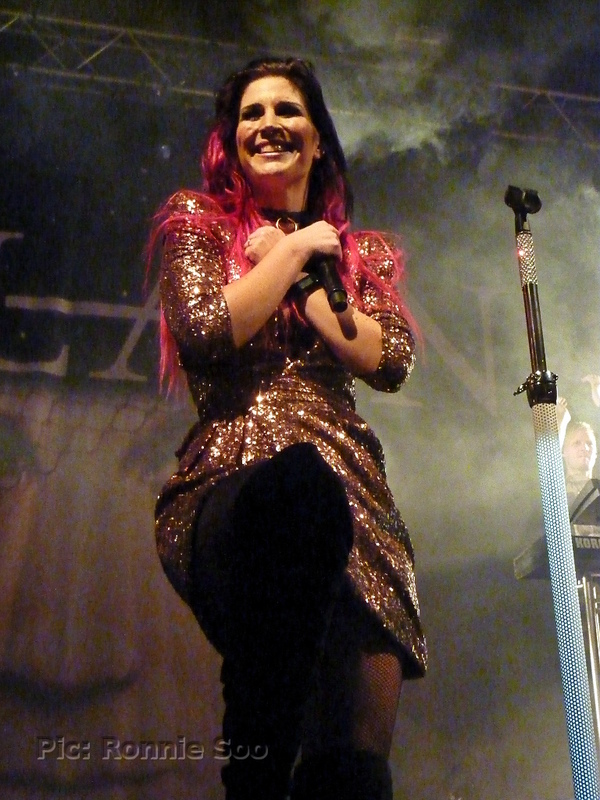 Lead singer Charlotte Wessels then made her grand entrance (clad in a glittery 1980s-style outfit complete with shoulder pads) to tremendous cheers. From the off she had the crowd in the palm of her hand, easily getting arms raised, fists pumped and ‘hey, hey!’ chants going. Bassist Otto Schimmelpenninck van der Oije once again handled the ‘growly’ vocal parts on this track and others that called for it, when not doing those he was all over the stage, frequently swapping places with Somers and fellow guitarist Merel Bechtold. The set was heavily weighted towards the current album (always a sign that a band really believes in their latest release) with no fewer than seven tracks from it performed. ‘Suckerpunch’ got the crowd chanting along with its ‘whoa, whoa’ hook, and the singer got the crowd clapping along for the first of many times to ‘The Glory And The Scum’. Their older albums were not ignored however; the crowd were encouraged to ‘keep those hands in the air’ for ‘Get The Devil Out of Me’ and ‘Army of Dolls’. They’re also celebrating the tenth anniversary of debut album ‘Lucidity’ this year, that record was acknowledged with ‘Sleepwalkers Dream’, ‘Pristine’ and ‘The Gathering’. ‘The Hurricane’ (from the current album) was as much a highlight of the live set as it was on record, showcasing both Wessels’ sweeter lower range as well as her stronger vocal in the chorus. 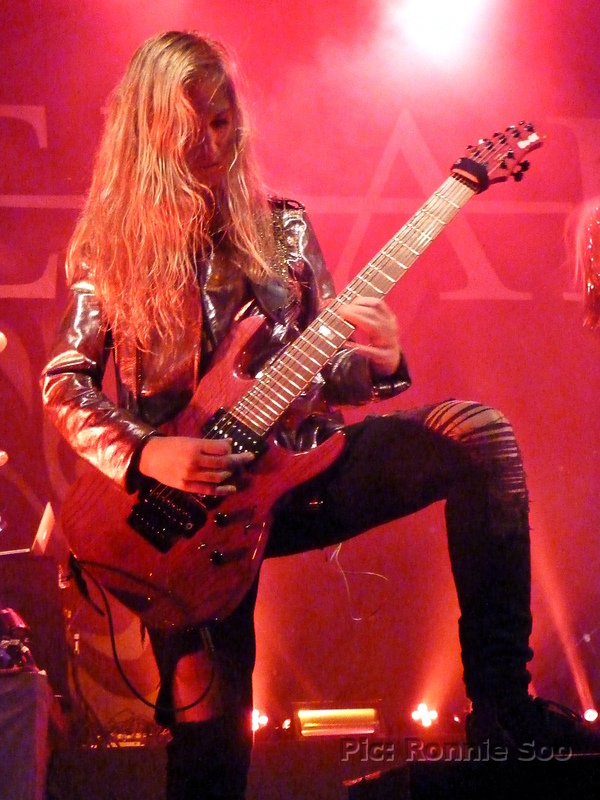 She delivered it with real passion and power, on that sort of form she’s as capable as a Floor Jansen of tingling the spine. ‘Fire With Fire’ showed how much more they’re now using Timo Somers’ vocal, he possesses a fine voice himself and since the addition of Merel Bechtold, he seems to have been given a little more freedom in both his guitar playing and backing vocal. Indeed the whole band contributed not just musically but visually too; the focus is inevitably on the singer when it comes to female-fronted bands of this type but from drummer Ruben Israel right through to keyboardist Martijn Westerholt, all were dynamic. Founding member Westerholt is often overlooked, high up on his perch at the back of the stage and stuck behind keyboards, but look up and you’ll often see him headbanging away – all while playing! During ‘Don’t Let Go’ (performed in the encore) everybody was bouncing around the stage (and into each other in the case of Wessels and Somers!) while the crowd also began to jump. The floor of the Ritz is notoriously bouncy and was effectively a trampoline during this number! After the usual closer of ‘We Are The Others’ the band took their bows. 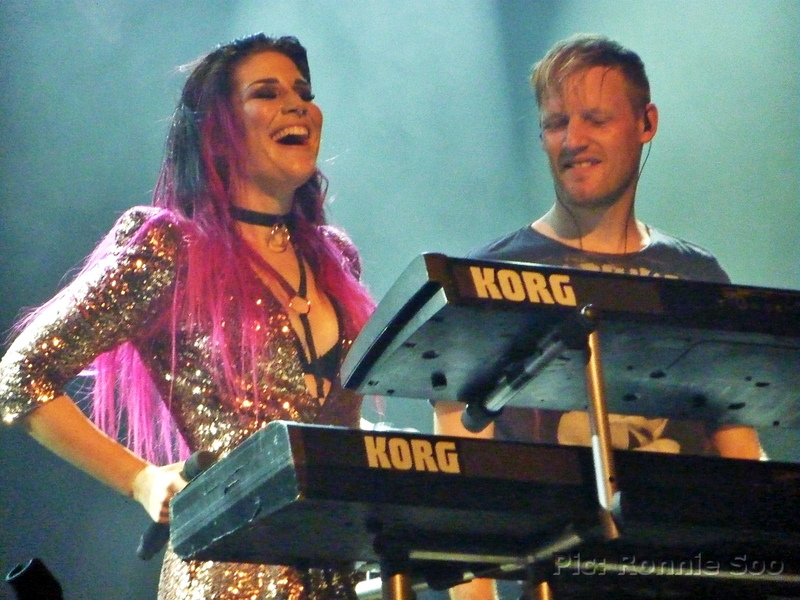 Delain’s popularity is growing each time they come to this country, they drew around twice as many this time as they did a year ago at Academy 2. Before long they’ll be at the same level as a Within Temptation or even Nightwish, just reward for the hard yards they’ve been putting in over the past five years. The door time on the ticket said 6:30, so I dashed up the M62 thinking I was pushed for time before doors opened, and fearing I’d get a lousy spot in this cramped basement venue. It is similar to the downstairs at Liverpool’s o2 Academy in capacity, and also in that if you can’t get somewhere near the front, you won’t get much of a view. However, after parking up (I know the back route in as a result of going to many gigs at this place, avoiding Oxford Road) and weaving my way around a massive queue for the main Academy (where 3 Doors Down were playing), the door staff at the University building told me that they weren’t open yet, and instead pointed me in the direction of the bar. One beverage later, and they had opened up the Club Academy doors. I missed out on getting to the front but managed to get near, and a reasonable spot in time for opening band Stray Train. I hadn’t realised this was a three-band bill, and it was news to me that it was actually a co-headline jaunt with German stoners Kadavar (this was not mentioned anywhere on the ticket). Stray Train (hailing from Slovenia) played a good if rather inoffensive set, they are a five-piece playing a similar style of retro hard rock to Blues Pills themselves. All had the ‘hipster’ look of short but styled hair and straggly beards, one of the guitar players was even sporting a MAN BAG (!) but it was their other guitar player who stuck out. Considerably older (and greyer) than the other members, it looked as though one of the band members had taken their dad out on tour! He got the short straw when it came to stage lighting too, there was hardly any in his direction all set! They didn’t leave a lasting impression, although they went down well with the crowd who’d made the effort to get there early. They didn’t hang about getting the stage cleared, even crew from the next band up were helping clear Stray Train’s kit away before setting up for Kadavar. I did raise an eyebrow when I saw them setting the drum kit front and centre of the stage, this band is a trio and I got a sense of foreboding when they plugged in the bass during setup, and it shook me to the core! They’re another band who had far too much of a backline for their surroundings, there were two stacks for guitar either side of the stage, and also two bass cabs either side with a head for each. When they came on (led by their drummer Christoph ‘Tiger’ Bartelt; flanked by bassist Simon ‘Dragon’ Bouteloup and guitarist/vocalist Christoph ‘Lupus’ Lindemann) it was a mass of hair, beards and overpowering bass. It appeared they had sound problems all night as crew appeared periodically to attend to ‘Dragon’s bass amp. Certainly the out-front sound I experienced was about ninety percent bass, it rather ruined things for me. Their music is epic stoner rock, with songs being dragged into extended jams, but there was so much bass I could feel it juddering through me all night. It wasn’t quite as bad as the Dinosaur Jr gig the week before, but it wasn’t far off and I do feel they’d have been better off leaving one of those amps off. It was way too much for a basement venue with a low ceiling and a cramped floor, a shame as I would probably have enjoyed their set given a decent sound. 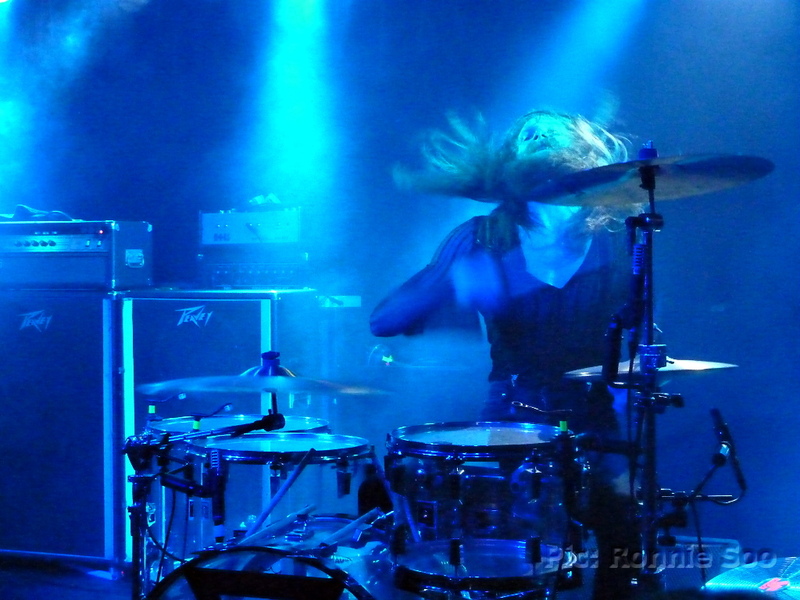 I soon understood why ‘Tiger’ was out front on the drums, he is basically Animal from the Muppets reincarnated – all whirling hair and wild expressions! Even their closing cover of The Beatles’ ‘Helter Skelter’ didn’t save things, the sound was just so bad that I couldn’t get into this band at all. After Kadavar’s set, there was more frantic activity as the crew cleared their backline with remarkable efficiency, revealing the Blues Pills backline, with the space at the back of the stage empty as the drum kit was being set up stage right. This band played in Liverpool last year (at the aforementioned o2 Academy) and some were unhappy with the sound that night too. They had considerably fewer amps/cabinets and so I was expecting a cleaner sound. I should have known better! When they came on (now a five-piece, with a keyboard player/rhythm guitarist added for this tour) and opened with ‘Lady in Gold’ from the recent album of the same name, the sound was little better than it was for the previous band. 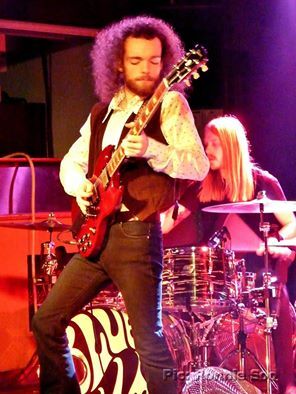 Indeed, Zach Anderson’s four string dominated in the same way Kadavar’s bassist had done, meaning it was actually difficult to hear vocalist Elin Larsson – and she is definitely a ‘blues shouter’ of the old school! It soon became clear why the drums were set up to the side as Larsson used the space in the middle as her personal dancefloor, either hopping about the stage (in stockinged feet) or stomping all over the place. She never stood still from first song to last! They played a set weighted towards the ‘Lady In Gold’ album but with some favourites from the first album too, including ‘High Class Woman’ and main set closer ‘Devil Man’. The other members of the band kept strictly to their positions on the stage, guitarist Dorian Sorriaux hardly moved from his spot just in front of drummer André Kvarnström, bassist Zach Anderson also held position the whole set while the fifth member (whose name I did not catch!) only emerged from his keyboards to play occasional second guitar. The focus therefore very much fell on the lead singer, who used the stage well even if the edge was taken away from her voice by the poor sound mix. In the encore, Larsson came out alone and went over to the keyboard to perform ‘I Feel A Change’ solo. This was about the only time we got to hear her properly all night, and she gave a fine rendition of the song. The rest of the band came back for ‘Rejection’ and ‘Gone So Long’ before taking their bows. I really like this band and enjoyed their set last year despite some fans’ complaints of the sound then, but this time around the sound mix definitely let them down. As it was, it was Stray Train who had the best out front sound of all three bands. It’s something Blues Pills (and Kadavar) really should address, I know they aim to be retro in their approach but a little 2016 technology in cleaning their live sound up would not go amiss! Is rock music now a niche market? That was the subject of a discussion I found myself getting involved in on Facebook recently, seeing as fans of this style of music are ageing with the bands themselves. I reluctantly had to concede that yes, it is now niche as even younger bands of this style are finding themselves with fans ‘of a certain age’. I know, because I am now one of them! Regardless, veteran band Y&T have carved their own niche within this niche market; they tour Europe every autumn and always include a good run of British dates, whereas in their heyday they were never seen in this country from about the mid-80s up to their initial split in 1991. (They appeared at the 1984 Monsters of Rock festival at Donington and impressed many, including myself but broke in their native US soon after.) Only mainman Dave Meniketti remains from the classic line-up, and he has had a 2016 to forget. 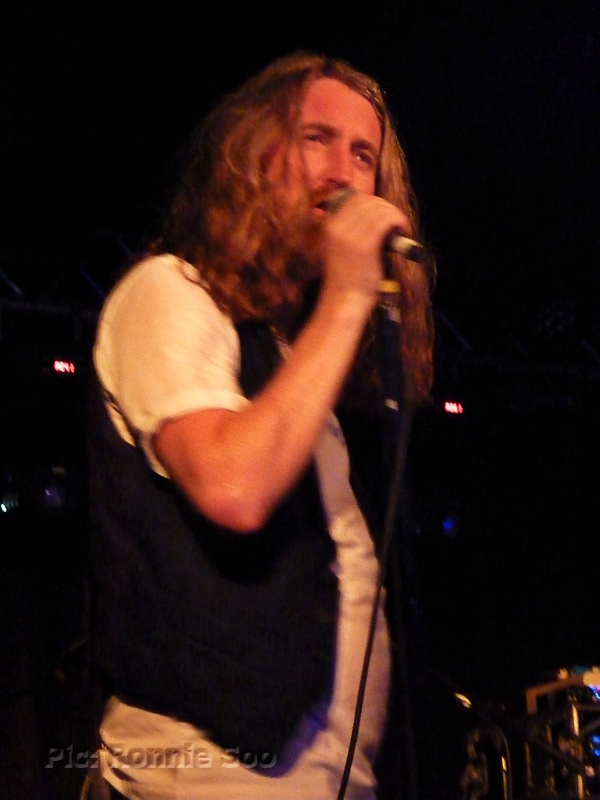 His wife Jill (who acts as the band’s manager) took ill during this tour and was hospitalised; he has had to bring in a new bass player (Aaron Leigh) in place of Brad Lang who took a leave of absence in order to deal with a self-confessed alcohol problem (and subsequently declared he would not return to the band so that he could recover properly). In addition, the band’s long-time soundman Tom Size had been diagnosed with cancer this year, and a fundraising page was set up to help with the cost of treatment. Sadly news of the soundman’s passing came through on the day of this show, a further blow to the band as their original drummer Leonard Haze had also passed away weeks before this tour took place. Trooper that he is however, Meniketti and his current band (guitarist John Nymann, drummer Mike Vanderhule and the aforementioned Aaron Leigh) still put on a night of classic hard rock for the fans who had turned out on a cold Sunday night in Liverpool. The audience was indeed ‘of a certain age’, although one or two young faces were there, accompanied by dads who obviously had brought their lads out to see ‘a proper rock band’ show how it should be done. The downstairs stage of the o2 Academy was encouragingly full, if not sold out it was a good attendance for the Bay Area foursome. 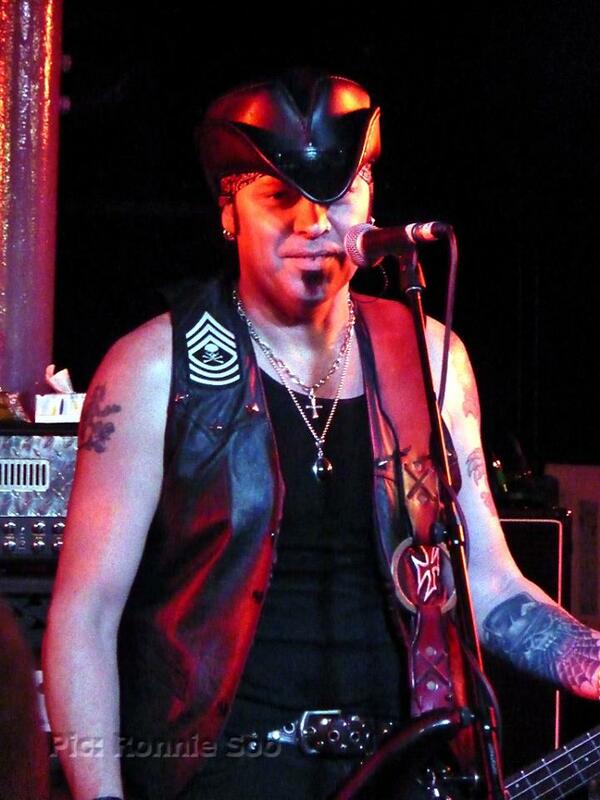 Before the main act we had another veteran act in NWOBHM survivors Praying Mantis. Still featuring founding members Chris and Tino Troy, they are now fronted by a Dutch lead singer by the name of John Cuijpers. They gave a very impressive set of melodic Metal, and Cuijpers’ voice reminded me of the great Ronnie James Dio. So much so, I think that Last In Line should be taking a serious look at this guy! I’m not well up on this band’s history at all, that will have to change. I treated myself to their ‘Legacy’ CD afterwards (their most recent effort, which showcases the band as they are now) and will make a note to look into the band’s recording history. When I saw Y&T last year in Buckley I observed that they have a back catalogue sufficiently deep for them to change their set around considerably, even though their last release (‘Facemelter’) came out way back in 2010. That proved to be the case, as the band opened with ‘On With The Show’ from that album before digging out classics such as ‘Lipstick and Leather’. One deeper cut performed on this night that even the frontman said isn’t played often was ‘I’ll Keep On Believin’ (Do You Know)’, from 1984’s ‘In Rock We Trust’ album. It was a much-changed set from last year although they still played fan favourites such as ‘Dirty Girl’ and ‘Midnight In Tokyo’. Early on in the set, Meniketti came to the front of the stage to give a brief eulogy to Tom Size and Leonard Haze; he then dedicated ‘Winds of Change’ to both, plus the late Phil Kennemore, the band’s original bassist who died in 2010. That cannot have been easy for him but he handled it superbly, bringing an ovation from the crowd. The crowd gave Y&T a superb response all night, every song was greeted with enthusiastic cheers which seemed to lift the frontman. I felt that just like the last time the came to this venue in 2012, Meniketti took a few songs to warm up vocally but once he did he was in great form. Then again, performing such demanding material as ‘Don’t Stop Running’ and ‘Mean Streak’ early in the set might have been asking a lot even of him, still one of the best vocalists of this genre. Of course, he also is a phenomenal guitar player with a magnificent tone many others would kill for, so even if his voice took a while to reach 100% his fingers still have the magic. They seemed to want to get on with it; it turned out they were working against a curfew and Meniketti said that they wouldn’t be able to play their ‘usual’ two-and-a-half hour set, settling for a mere (!) two hours and keeping chat to a minimum. It was still a terrific value show in a setting that allowed the performers close contact with the audience. This band delivers the goods year in and year out and really should be celebrated more; yes they had their moment in the sun during the 1980s but arguably are still as good today as back then. In a year when we’ve lost many iconic rock stars, it’s great to see at least one band from those days still kicking and still prepared to take their music to the people.